In three games during the regular season, DC United and New York scored a combined 14 goals, but it was a 1-0 scoreline that pushed DC into the Eastern Conference finals (to face Houston Sunday on NBCSN, 4:00 PM ET). After drawing 1-1 in the first leg, one of the biggest rivalries in MLS was essentially reset to square one for the second leg. Speaking to NBCSN’s Kyle Martino before the match, DC head coach Ben Olsen noted that the series has felt like it’s been going on for a month -- when really it’s been less than a week. But so much has happened, both off the pitch and on, that it’s a little surreal to think that we’ve only been at this for a few days. Start with a certain Hurricane Sandy, which left Red Bull Arena without power just before the first leg was set to be played there. DC United were meant to play the second leg at home, having earned the home-field advantage by finishing second in the East (ahead of third-place New York). However, with Red Bull Arena in no shape to host a match, the easiest solution was to switch the home dates. New York would travel to DC for the first leg, and DC would head to New York for the second. Some DC fans weren’t happy about the change, but ultimately, it was a necessary, and indeed the right, decision. DC-NY games always promise entertainment, but the first leg of this series offered perhaps the most baffling goals you’ll see in a playoff game, not to mention a missed Chris Pontius penalty 33 minutes in. DC United took the lead in 60th minute, if you can really say that it was DC’s doing. Perry Kitchen sent a cross into the box for Nick DeLeon, but it was Red Bull defender Roy Miller who knocked the ball into the net. Not pretty, but DC happily accepted the help. Just five minutes later, though, DC returned the favor for New York. Bill Hamid came out to catch a ball and ended up falling into his own net with the ball still in his hands. Bizarre, yes, but own goals count just the same. 1-1. With emotions running high, DC’s young right back Andy Najar earned himself a red card in the 71st minute. First given a yellow card for a foul on Joel Lindpere, Najar then hurled the ball at referee Jair Marrufo and was shown a second yellow. United were down to ten men for the remainder of the match and would also have to play the second leg without one of their most promising and integral players. After a wild night of soccer, the 1-1 scoreline was somewhat disappointing for DC, who would have preferred a win at home, but decent for New York, who now needed only to gut out a win in front of their home fans. Of course, it was impossible that the second leg would simply go on without anything interesting happening. Red Bull Arena welcomed Winter Storm Athena to town, and as the teams prepared for Wednesday’s game, the snow kept falling. Ben Olsen wanted to play. Hans Backe did not. Despite efforts to shovel enough snow off the pitch to make the game playable, in the end Athena won. The game was postponed until Thursday night. For the 700 DC United fans who had traveled to New York in eleven free buses (part of the compensation for switching the home dates), the cancellation was hugely disappointing. But DC United, though they didn’t take the field, still came away winners that night. Along with owner Will Chang, the team climbed into the stands to celebrate their fans and thank them for their support. The fans may have had to make the trip home without having seen a match, but they also got to experience an unforgettable moment with their team. DC still managed to send around 250 fans up in five buses for Thursday’s night game, and boy, were they rewarded. Whoever was going to advance to face Houston had to win, but the game stayed locked at 0-0 with chances for both sides. Until the 69th minute, that is, which is when it seemed inevitable that the Red Bulls would take the lead. Kenny Cooper broke into the box, and goalkeeper Bill Hamid, off his line, clipped the forward, who then went down. 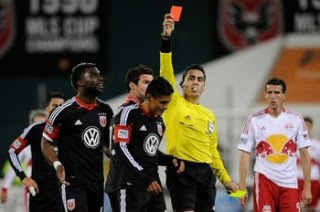 Referee Mark Geiger had no choice but to show Hamid a red card and award the penalty to New York. Hamid was furious, but he had to go, and backup keeper Joe Willis entered the match. Cooper converted the penalty and was ready to celebrate, but Geiger called the goal back for encroachment. Cooper took the penalty again, but this time Willis saved it and kept the game scoreless. 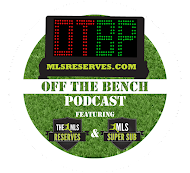 For DC fans, the moment was utter perfection -- because back in August, United drew 1-1 with the Philadelphia Union after a Dwayne De Rosario penalty was called back for encroachment; DeRo skied his second attempt over the bar. The referee in that game? Mark Geiger, of course. DC were left down a man, but they wouldn’t have to be outnumbered for long. Six minutes after the penalty debacle, Rafa Márquez was given a second yellow for a foul on Chris Pontius, thus earning a red card of his own and evening out the teams to ten each. It’s heartbreak for the Red Bulls and their fans, but all those who wear the Black and Red are elated. Two games has felt, as Olsen said, like a month-long journey. We had a venue switch, own goals, red cards, postponement, retaken and saved penalties, and finally, ultimately, a winner. We need 2 goals on Saturday. Win, lose, or draw, if we don’t get out of this slump, the greatest Defense in the world won’t save us. Really hope Benny and Chad are taking note of this for next offseason-this is what happens when you release a Branko and replace him with a perpetually injured Thorrington… To see more info please visit http://essayhogwarts.com/thesis-writing/.